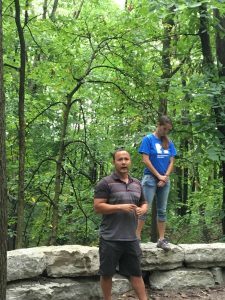 On July 18th, I had the privilege of accompanying over a dozen Michigan Public School teachers on a journey to historical sites in Ohio, Michigan, and Ontario. 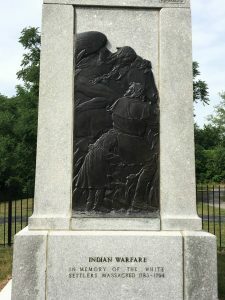 The sites commemorate battles in the late 18th and early 19th centuries, in which Native Americans were heavily involved in territorial struggles between British and American forces. The trip was part of remarkable week-long itinerary for educators, put together by one of our Heritage Grantees to launch the project, “Anishnaabek – Odawa/Ottawa Journey Towards Understanding.” Sponsored by the River Raisin National Battlefield Park Foundation, the project brought this group together in order to produce a pilot curriculum for middle-school students. 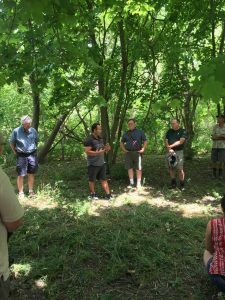 The curriculum will emphasize contemporary Michigan Native American tribes’ perspectives on their ancestors’ involvement in local and regional history. In the words of Eric Hemenway, Michigan Humanities board member and Director of Repatriation, Archives and Records for the Little Traverse Bay Bands of Odawa Indians: “It’s about honesty.” In other words, the project aims to include a more “honest” version of historical events in the curriculum—a more complete story, told from multiple angles, of what shaped the United States into what it is today. Because Native American history gets swept under the rug or distorted by outsiders, the project brings in tribal experts like Eric Hemenway to give voice to often overlooked perspectives. Hemenway stresses the unique value in the opportunity for Native Americans to tell their own stories, bringing the nuances and feelings that dwell within the Native community into the history classroom. When combined with the expertise of academic historians, memories from Native communities create a powerful “hybrid” story that can change our perception of what history means to people—with special emphasis on the importance of place in Native American cultures. For contemporary Native American students, learning history in this way can help to counter the dehumanizing effects of having outsiders tell their story for centuries. This loss of ownership of historical memory parallels the more general sense of loss that tribes across North America have been shouldering for centuries—loss of territory, language, community integrity, and sources of livelihood that directly resulted from the westward expansion of the United States. While there still remains an immense amount of work to be done for Native communities to rebuild in the various ways they desire, Hemenway is optimistic about some recent developments. For example, the 2015 renaming of Alaska’s Mt. McKinley to Mt. Denali, reflecting the indigenous name for the mountain, has important implications for restoring a sense of sacred space. Such small victories are significant in that they begin to pull back the layers of conquest and appropriation that Native Americans have suffered, even if only symbolically. The same can be said of the public outcry against sports mascots caricaturing Native Americans, as well as Oregon’s decision to outlaw the highly offensive and demeaning term, “squaw,” which still figures in the names of landmarks, streets, and schools around the country. 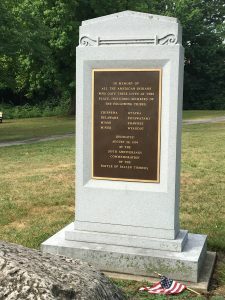 Where historical monuments once provided a one-sided perspective on violent clashes between Europeans and Native Americans, some progress has been made towards commemorating losses on both sides. Hemenway noted that incidents that were once glossed as “massacres” might better be understood as revenge killings, in which Native Americans retaliated against settlers for the slaughter of their people and the destruction of their villages. 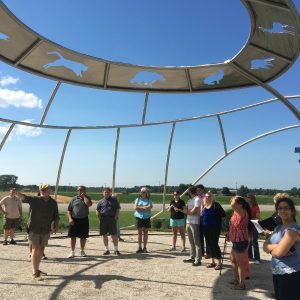 The new history curriculum, which includes class field trips to some of these sites, aims to give both Native and non-Native students ownership over their state’s history. For Native students, including them more directly in the retelling of historical events is empowering. It can temper the alienation that many Native American students feel in school when the history they hear does not connect with the stories they learn at home. For other students, establishing a well-rounded sense of their state’s history can help dispel misconceptions about Native Americans—whom Hemenway believes are the most misrepresented and stereotyped population in the country. When he visits classrooms, as he frequently does, Hemenway says that students often want to know “Where is the Indian?” They expect to see moccasins and a feathered headdress. The opportunity to interact with a representative of a contemporary Native community, along with the new history curriculum developed by this Heritage Grant project, will lead to the type of steady, incremental changes that will ultimately improve communication and understanding across ethnic and cultural divides in the state of Michigan.